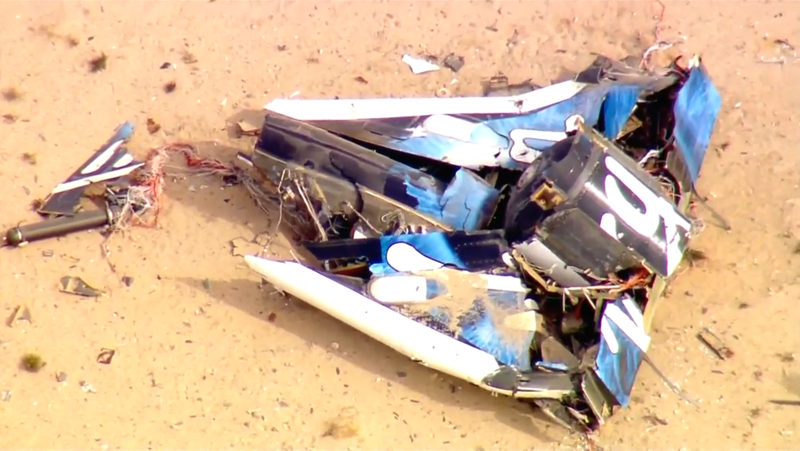 The commercial spaceflight industry is reeling from its second major accident in less than a week. Virgin Galactic's futuristic SpaceShipTwo rocket plane, built to carry adventurous tourists out of the atmosphere for brief sub-orbital spaceflights, suffered a catastrophic failure Friday during a rocket-powered test flight high above the Mojave Desert, destroying the aircraft and reportedly killing one of the two pilots. The disaster was a devastating blow to Virgin's team of test pilots and engineers and its charismatic owner, Sir Richard Branson, who had hoped to begin commercial flights to the edge of space starting early next year. How the crash might impact those plans is not yet known, but commercial flights undoubtedly will be put on hold indefinitely pending the outcome of a failure investigation to figure out what went wrong and what might be required to restore confidence in the spaceplane technology. The failure came just three days after an Orbital Sciences rocket carrying a commercial cargo ship bound for the International Space Station exploded seconds after liftoff from the Mid-Atlantic Regional Spaceport at Wallops Island, Virginia. But the two mishaps were not related. Orbital's rocket and spacecraft were financed through a NASA contract, with government input and oversight, while Virgin Galactic's program is a purely private venture with no government involvement beyond FAA licensing and permitting. Virgin's twin-fuselage WhiteKnightTwo carrier jet, with the SpaceShipTwo rocket plane attached to its belly, took off from the Mojave Air and Space Port in Mojave, Calif., northeast of Los Angeles, just before 12:30 p.m. EDT (GMT-4). The carrier plane typically lifts the spacecraft to an altitude of some 50,000 feet before releasing it to fly on its own. The deploy altitude reached Friday was not immediately known. #SpaceShipTwo has been released by WhiteKnightTwo, and is now flying freely for the 35th time. Ignition! #SpaceShipTwo is flying under rocket power again. Stay tuned for updates. Then, a few moments later, the tone suddenly changed as Virgin tweeted the first word something had gone wrong. Witnesses reported that the spaceplane appeared to blow up or come apart in the air shortly after engine ignition. Local emergency crews quickly headed to multiple debris sites, reporting large pieces of wreckage on the ground. Views from a news helicopter showed one of the rocket plane's tail booms resting on the desert floor. SpaceShipTwo is based on Burt Rutan's smaller single-seat SpaceShipOne, which became the first privately funded spacecraft to fly above 100 kilometers -- the accepted definition of where "space" begins -- in 2004. SpaceShipTwo is a scaled-up version of the rocket plane that can carry a crew of two along with four to six passengers. Still built by Scaled Composites, the spacecraft is not capable of reaching orbit. It is a purely private venture and there is no NASA or other U.S. government involvement other than FAA licensing and permitting. But Virgin Galactic is the centerpiece of a new push to "commercialize" space travel, the first private company to offer trips out of the atmosphere that are open to private citizens. The cost of a ticket is estimated at around $250,000 per seat and more than 500 men and women have signed up for flights. "This just demonstrates how hard spaceflight really is," said John "Danny" Olivas, a former shuttle astronaut who serves as a mission assurance and flight safety consultant. One of his shuttle crewmates was C.J. Sturckow, now one of Virgin Galactic's test pilots. Olivas said Sturckow was not aboard the flight that crashed. "Because of the complexities associated with spaceflight, whether you're sub-orbital or go into orbit, there's an intrinsic amount of risk associated with that because the requirements to make any of that happen require so much power. Let's face it, we've been doing this for 50 years but our flight experience is relatively low. "I hate to say this, but I kind of knew there was a day that was going to be coming where there was a major accident like this and I was hoping it was going to be later rather than sooner. But ultimately, the success of the industry really depends on our ability as a nation to do what we need to do to power through it, to learn what we can, to fix it and move on." He said the Virgin team had been "working really hard to deal with things like thrust oscillation issues with their engine. This is one of the reasons they changed the design for this particular flight as I understand it. The question is, what are they going to do to track down what went wrong?"